Stig Ørberg, 60 years old, wakes up in Denmark every morning at 5am- he washes his face, grabs two apples, a banana and a bottle of water then heads off to Kalundborg. After a one hour drive north from his home to the Kalundborg fjord, he meets his colleague and by 6:30 they're in their kayaks ready to sail their usual 6-10km along the coast of the fjord. Although it's obvious he's an ardent kayak lover- waking up at the crack of dawn every morning to go kayaking, this passion of his began only 4 years ago. It began when he moved schools and began teaching in Kalundborg where he met his colleague Leif who has been a member of the rowing club of Kalundborg since he was young. 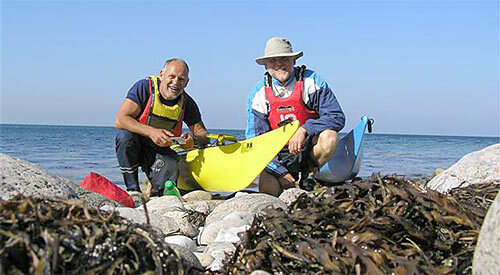 Although Leif had always gone rowing in the Kalundborg fjord, it was only after he bought himself a kayak for his fiftieth birthday that he started to become an avid kayaker. After Leif and Stig started talking about an interest for kayaking, they decided to give it a try and meet every morning at the rowing club to go kayaking before work. Kayaking has always been a dream of Stig's ever since he took a course in kayaking more than 20 years ago as part of an outdoor recreation seminar. Since then, he had always dreamed of taking up kayaking, but never gave it a serious try- at least not until he turned 56. After hearing from his colleague about the rowing club, he thought it sounded like a good idea to finally realize this dream of his and he joined the rowing club. He was able to loan a kayak from the rowing club and his colleague Leif taught him all he needed to know in order to kayak safely. Now that the rowing club has seen how devoted Leif and Stig are to their morning kayak ritual, they've begun advertising to other older people who might be interested in joining them every morning. In addition to the few who join Stig and Leif in their kayak tours, every morning there are at least two row boats with 4-5 people each who are retired and up to 70 years old. A community centered around kayaking and rowing has started at Kalundborg fjord where older rowers can talk and have a nice time together. 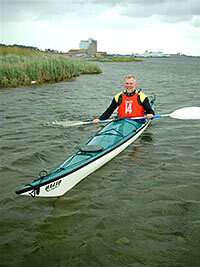 For Stig it was exciting to start kayaking at 56 years old. It was the first time in a long time that he tried something new. He was never so involved in a sport like this before. As a boy he had sailed boats before, but nothing really came out of it. In order to realize his kayaking dream, all it took was a bit of conversation with his colleague and some organization- and since then he doesn't think it has been difficult at all to begin kayaking. The most important thing he needed to learn was to evaluate how much physical strength he might have when encountering large waves, or a strong headwind etc. This knowledge was acquired partly by learning, and partly by doing. Maybe younger kayakers have an easier time learning the 'Greenland roll' making it easier to flip the kayak if you get turned over by a big wave, but otherwise Stig hasn't noticed a difference between the younger kayakers and the 'grey-haired' kayakers. His best piece of advice to anybody who would like to start kayaking is don't try it alone. It is important to learn how to kayak in the right manner. Join a club or take some classes in order to begin on the right foot and to avoid potentially dangerous situations. Otherwise, there's nothing to prevent you from realizing your kayak dream.